The pace and intensity of Iran’s presidential campaign have picked up in the final days before the May 19 vote. The election has basically turned into a two-man race between President Hassan Rouhani and conservative Ebrahim Raisi. For the first time in 20 years, the top two candidates are both clerics. 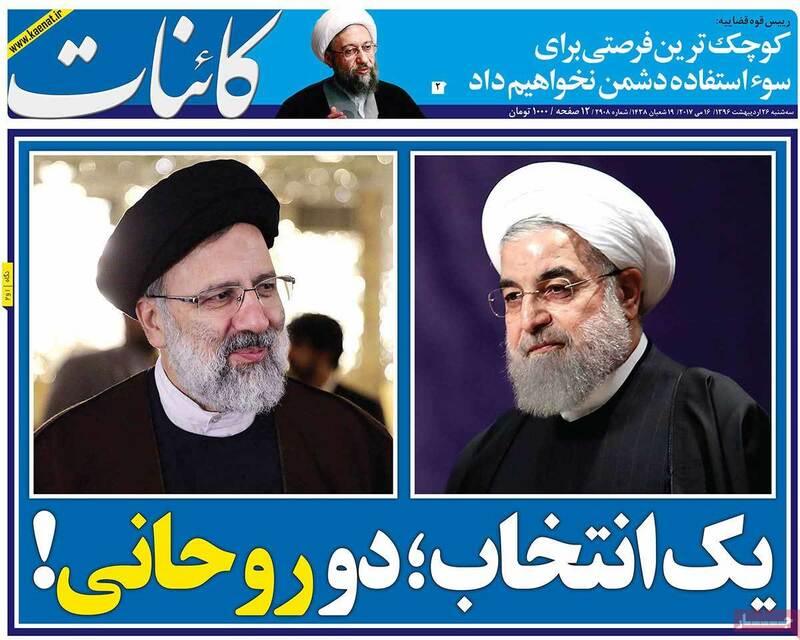 Headline in Ka'enat: "One Election, Two Clerics"
On May 15, Tehran Mayor Mohammad Bagher Qalibaf dropped out of the race and called on his supporters to back Raisi. In the cartoon below, President Rouhani and Vice President Jahangiri have rolled up Qalibaf in a rug —a reference to Qalibaf's last name, which literally means "carpet weaver." Raisi’s May 15 rally in Isfahan attracted thousands of attendees. It was widely covered by conservative media outlets. Raisi met with popular rapper Tataloo and won his endorsement. Iranians on social media thought the meeting was odd because conservatives Tataloo has been arrested by security forces for his controversial music. A graphic of Raisi with Qassem Soleimani, the commander of the elite Qods Force of the Revolutionary Guards, and the late Ayatollah Mohammad Beheshti, who was assassinated in 1981, has been circulated on social media. Rouhani repeatedly presented the election as a stark choice between freedom and oppression in his last rallies, which were among his largest. 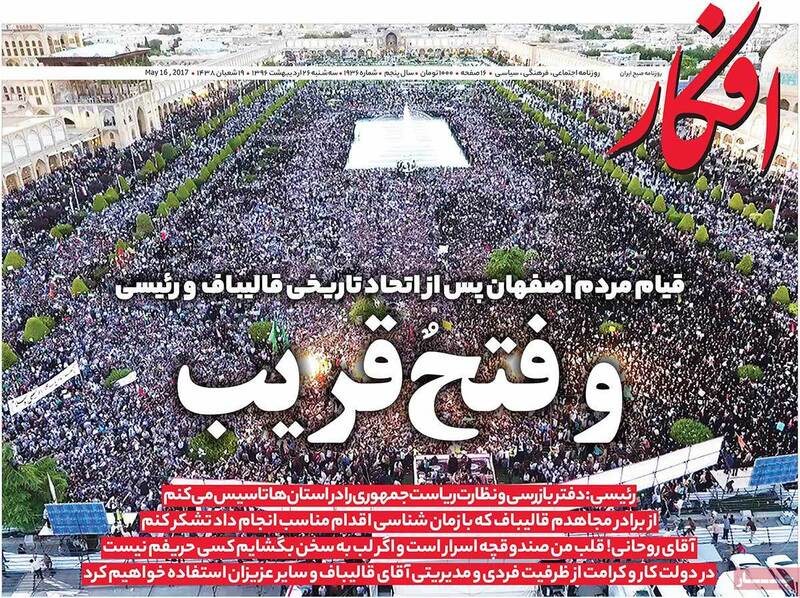 Conservative newspapers used photos to portray Rouhani’s rallies as smaller while reformist papers used photos that suggested the opposite. The flavor of the crowds at the two rallies were vastly different with pop music and dancing at Rouhani’s event and religious anthems at Raisi’s rally. Huge crowd partying at #Rouhani campaign in #Mashhad. Crowd at #Raesi campaign singing religious song on Emam #Reza in #Mashhad. Rouhani’s supporters dared to chant the names of former Prime Minister Mir Hossein Mousavi and former Parliamentary Speaker Mehdi Karroubi. They have been under house arrest since 2011 for supporting the Green Movement protests following the disputed 2009 reelection of Mahmoud Ahmadinejad. Some supporters held signs that were critical of government encroachment on their personal lives. On May 16, Eshaq Jahangiri, a reformist who has been Rouhani’s first vice president since 2013, withdrew as expected and urged voters to support Rouhani. On May 17, Seyyed Hassan Khomeini endorsed Rouhani in a video message. The grandson of Ayatollah Ruhollah Khomeini is widely considered the heir apparent of the late revolutionary leader’s legacy. Rouhani called out hardliners using bold language during his speech in Mashhad. Rouhani warned security forces not to meddle in the election. "We just have one request: for the Basij and the Revolutionary Guards to stay in their own place for their own work," he said, according to the Iranian Labour News Agency via Reuters. On May 4, Rouhani’s campaign manager Mohammad Ali Vakili confirmed that police forced the closure of several campaign offices across the country. Security forces blocked staff from entering or leaving campaign facilities. Plainclothes members of the Basij militia reportedly attacked Rouhani campaign offices in Tehran, Mashhad, Qazvin, Babolsar and Isfahan. Rouhani referenced the sabotage in a post on Twitter and Instagram. "People of Iran, if hardliners tore my picture or even swore at me in front of our [campaign] headquarters, do not respond to them. They have another goal." Faezeh Hashemi, the daughter of late former President Akbar Hashemi Rafsanjani, was barred from speaking at two Rouhani campaign events in May due to her prior conviction. In March, Hashemi, an outspoken women’s rights activist and former lawmaker, was sentenced to six months in prison for spreading anti-state propaganda. She has appealed and the final ruling has yet to be issued. At one campaign rally, she grabbed the microphone to support Rouhani. Filmmaker Asghar Farhadi, a two-time Oscar winner, endorsed Rouhani on May 14. “I will vote for Dr Rouhani and I hope that those who remain undecided would use their basic right and vote despite all the understandable reasons and conditions that they may have, for the fate of children in our homeland and future generations,” he said, according to The Guardian and Iranian media. Three men, all in their early twenties, were sentenced to a total of 36 years in prison for “insulting” the Islamic Republic on Telegram, used by an estimated 40 million people in Iran. Some 1.2 million posts are shared every day on more than 100,000 channels.